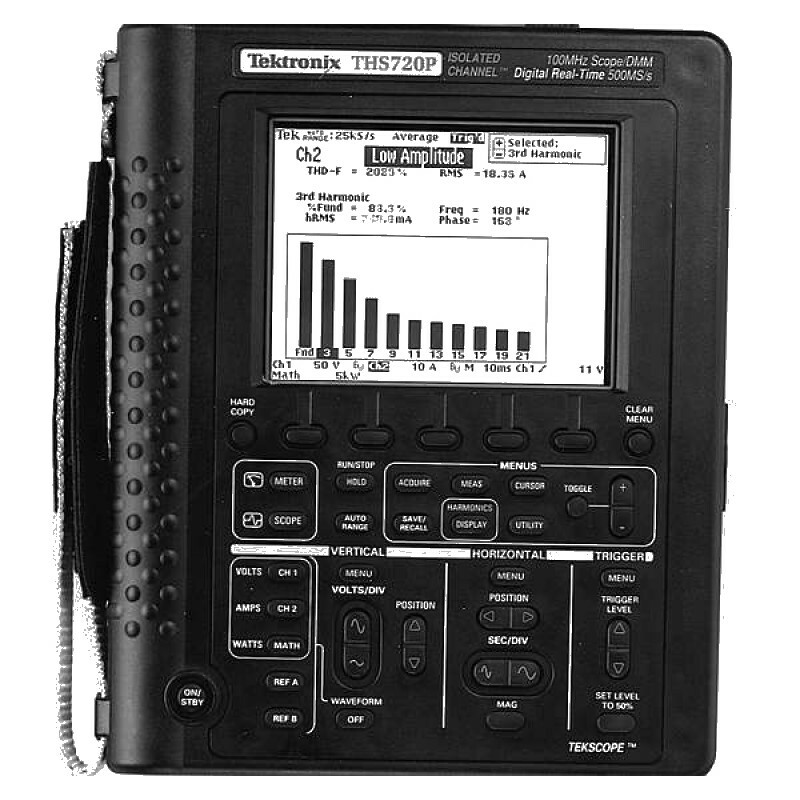 The THS720P TekScope IsolatedChannel Oscilloscope/DMM is ideal for electrical/ power electronics applications. The THS720P includes features specifically for electrical/power electronics measurements which allow testing and verifying correct operation of motors, checking transformer efficiency, verifying powersupply performance and measuring the effect of neutral current. These features include harmonic analysis, power measurements and statistics and PWM motor drive triggering. It also contains the powerful features of a modern oscilloscope that enable troubleshooting and verification of complicated electronic control circuits controlling the high-voltage powerelectronics circuitry. The THS720P shares measurement features with the THS730A, THS720A Oscilloscope/DMMs, which are ideal for electronic applications. Motor Trigger – Triggers on 3- and 5-level pulse-width modulated power signal. Harmonics – Up to 31st (30 Hz to 450 Hz).